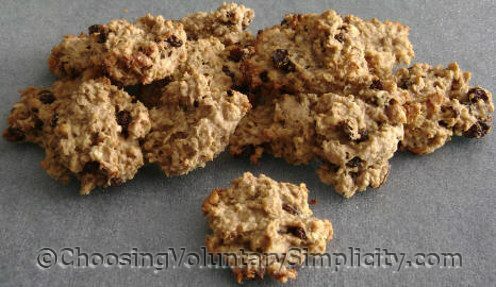 I have received such tremendous response from my egg-free, milk-free vegan cakes posts, I thought I would share this recipe for gluten-free, egg-free, sugar-free oatmeal cookies. Because these cookies contain no sugar, they depend on the bananas and the raisins to give them a sweet taste. Fully ripe bananas work best and will make the cookies taste sweeter than bananas that are not as ripe. I have found that pureeing the bananas instead of mashing them makes a tremendous difference in the sweetness and flavor of the cookies. I think this is because the thinner puree is “wetter” than mashed bananas and can be more evenly distributed throughout the dough so the sweetness and flavor of the bananas is more pronounced. All oats are naturally gluten-free, but Quaker brand oats often contain trace amounts of gluten. I telephoned the Quaker Oats company this morning to verify this and was told that they buy their oats in bulk and there is a possibility of gluten cross-contamination during transport and processing. So if gluten allergy is a concern, make sure that the oats you use in these cookies are labeled as gluten-free. You could also make these cookies milk-free by substituting 1/4 cup of water for the skim milk (I have done that and have noticed no difference in taste or texture)… soy-free if you do as I do and use melted butter instead of margarine… and nut-free if you omit the walnuts I have added to this recipe. Note: Before you make these cookies, be sure to read my update to this post. Heat oven to 350°F. Mix all the ingredients together in a bowl. It’s important to mix the ingredients thoroughly so all of the oats will be evenly moistened. Let the cookie batter stand for about five minutes, then drop heaping teaspoons of dough onto a greased cookie sheet. Bake for approximately 15 to 20 minutes or until the cookies are lightly browned. Remove to a wire rack to cool. Makes about 2 1/2 dozen cookies. I love the possibilities that recipes like this one open up for those people who face so many food restrictions because of food allergies. Although these cookies lack the very sweet taste of traditional oatmeal-raisin cookies, they have a wonderful chewy texture and taste all their own. I hope you will give them a try. My 4yr old has multiple allergies and he yearns for the cookies and cakes he can’t have like the other kids. I can’t wait to make these. Such healthy ingredients too. I love this blog and YOU. Thanx!!!!!!!!!!!!!!!! from a very grateful Mom. I’m not a cook but I think I could make these. I haven’t eaten a cookie since I was diagnosed with allergy and I miss them. These look good. Thanks so much, I have a lady friend who is diabetic and cannot have gluten either. This is such a blessing because the packaged items all have sugar. Oh, boy!! I JUST made a large sheet cake using your fabulous chocolate mix-in-the pan recipe. I love, love, love oatmeal cookies so much, and I cannot wait to try this one. I know it will be a winner, just like everything else that you do! Also, thank you for helping all of your readers with the close look at grocery budgeting and eating nutritiously. We are trying our best here in Miami to be healthy, and we can use all the wonderful hints and tips! One of the little things I do to help is to make a double batch of a healthy dish, and freeze half for another meal later on. It seems to save time, and most of all, sanity! I try very hard to make everything that I eat, including my bread, from scratch. I feel like that gives me much more control over my budget. Thanks once again for all of the time you devote to helping others. Have a wonderful day! I look forward to trying these soon!! Your recipe was so timely! I made 3 batches for a function at my kids’ school this evening and the recipe was exactly what I needed. I didn’t add nuts, but I’m sure they were an excellent addition to the recipe as I could almost taste their absence! I did throw in some chopped up apricots and would do it again. By the way, we always freeze our bananas (peeled) when we have too many of them. For this recipe, I microwaved them for 2 minutes and they became beautifully squishy. these cookies are so good! i had been looking for a wheat-free, sugar-free, artificial-sweetener-free cookie, and these hit the spot! i kind of cheated though, because i added organic chocolate chips in place of the walnuts. next time, i may try raw cacao nibs for something a bit more healthy. i look forward to checking out the rest of your site! I’ve been sugar fasting between Lenten and dieting and never get any treats. I incorporated cran and blueberries to the recipe to make a wonderful breakfast snack paired with strong cup of coffee. Thank you so much for this recipe!! I’m 16 years old and have recently begun to show some interest in (healthy+ organic) cooking to improve my skin and because I have discovered how bad it is for the body and mind (influences how I concentrate in school) with all the toxins we get from non-organic food and too much sugar. So this recipe (and blog) just came at the perfect time and I have just finished making the cookies which are great! My littlebrother who only likes sugary stuff LOVES them! thank you so much:) I will be making these over and over again. I didn’t add the vanilla extract and nuts but they taste great. I just made these and they turned out beautifully. I added a bit of cinnamon, excluded the walnuts (as a preference) and used one less banana (only had two on hand) but it still worked out great. Thanks so much for this recipe; my mother can finally have some cookies that are healthy and taste great! My son has an egg allergy so I’m always looking for recipes for yummy treats that are egg-free. I tried two variations on this recipe. The first one I followed the recipe but added a 1/4 c brown sugar and chocolate chip. They turned out so well and I ended up eating so many that I decided to try a lower fat healthier version. Instead of butter I used applesauce and I added a little honey and cinnamon and dark choc. chips. They were also pretty good – not quite as good as the first batch but also healthier – trade off I suppose. Also to avoid the disappointment of them not tasting like oatmeal cookies I called them banana oat cookies. These cookies taste great! I adding walnuts this time and they tasted even better! I found this recipe to be easy-to-follow and quick. I look forward to trying more of your recipes. Thank you. I bought a cookie at the cake store down the street from where i work and loved them. So, I started searching for a recipe. Guess what? I found it. Your recipe taste the same as theirs. So, I can bake them at home far cheaper than what she is charging. Thank You!!!! Can’t wait to try these! It’s so hard to GF find recipes without sugar/honey/agave, etc. They look delish! Just made these for the first time and they are great!! Thank you!! These are good! I added cinnamon and used water instead of milk. I also used applesauce in place of the butter. They came out great! Amazing!! Just made these this afternoon for my son who is allergic to eggs and nuts.. Thank you for sharing this recipe and your blogs! You are a life saver! I’m on a allergy/food sensitive diet for the next few weeks and I can have this for breakfast. I made a batch of these tonight and although I forgot the vanilla, they turned out pretty good. I loved how the dough could be made in my food processor. My sometimes picky 4 year-old didn’t care for them much, but my husband who is not a great lover of “healthy” treats, ranked them as OK. No opinion from my 2 year-old. I think I am going to share this recipe with my neighbor who’s daughter has Ciliac disease, she is always looking for easy, low cost things to make her child. I’m getting ready to try these out! I LOVE healthy cookies :) If you want to make it EVEN that much more healthy you could substitute the butter for coconut oil. Coconut oil is so amazing for baking needs, and truly everything else lol. Its medium chain fatty acids so it breaks down nearly instantly so it can be used for energy etc. Also its delicious and helps to balance blood sugar. I havent made these yet, but I know that you can often use avocado as a replacement for butter in baking (and you can’t really taste it. I’ve made vegan pudding that was banana and avocado based. You could also use coconut, almond, hemp, or rice milk instead of the skim milk. I plan on making these with olive oil or avocado and coconut milk for my rather allergic boyfriend. I made these for my husband who has recently developed son food allergies, I made it with a dash of oil instead of butter and I used coconut milk instead of cow’s, they are delicious!!!!! thanks again for your wenderful recipes!!! They were very, very good indeed. I will be making these often. Thank you for the recipe. made these last nite…supper yummy and the perfect amount of ‘sweet’… thanks! Hi, I haven’t made these yet. However this recipe is exactly what I have been looking for!!! I’m making them for AWANAs which two of the children are allergic to eggs and possibly milk plus I like to give my own Children only Healthy deserts (they call fruits and most veggies Gods natural candy) Thxs so much for taking the time to post this I also really appreciate the alternates in the article.